Twenty-four species of Persicaria are recorded in Britain. These include the native Alpine Bistort (P. vivipara), Amphibious Bistort (P. amphibia), Common Bistort (P. bistorta), Pale Persicaria (P. lapathifolia), Redshank (P. maculosa), Small Water-pepper (P. minor), Tasteless Water-pepper (P. mitis) and Water-pepper (P. hydropiper). The BSBI provide a downloadable plant crib for Persicaria, riparian species. 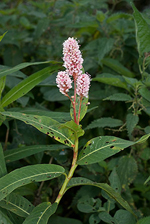 Three British miners are recorded on Persicaria. A key to the European miners recorded on Persicaria is provided in Bladmineerders van Europa. On ? 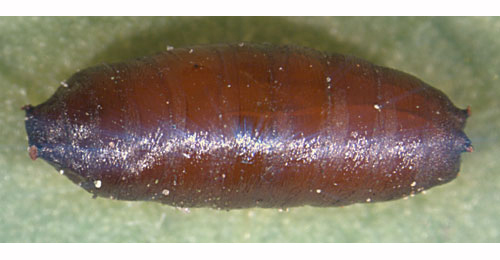 Oxyria, ? Polygonum and Rumex, but not yet Persicaria, in Britain plus Emex and Persicaria elsewhere. Widespread in Britain. Also recorded in the Republic of Ireland. Widespread in continental Europe. On Convolvulus and Fallopia, but not yet Persicaria, in Britain and Fallopia and possibly Persicaria elsewhere. Uncommon in England - Warwick, Oxford, Hants and West Kent. Widespread in continental Europe. Pegomya setaria (Meigen, 1826) [Diptera: Anthomyiidae].